LYNDON—“Osage County EMS is now state licensed. It’s official,” Brent Teter, chief executive officer of TECHS Inc., told the Osage County commissioners Monday. 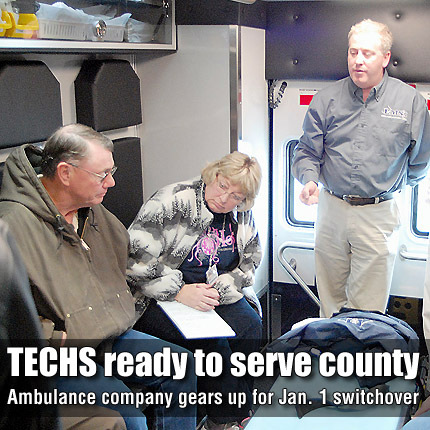 Teter was at the Dec. 5 meeting with four other staff members to update commissioners on the company’s progress toward providing the county’s ambulance services effective Jan. 1. Teter said the company’s steps since signing a contract with the county in May have been to hire staff to serve Osage County, set up training sessions for area first responders, dispatchers and TECHS staff, locate ambulance stations in the county, sign mutual aid agreements with surrounding counties, and secure ambulances.